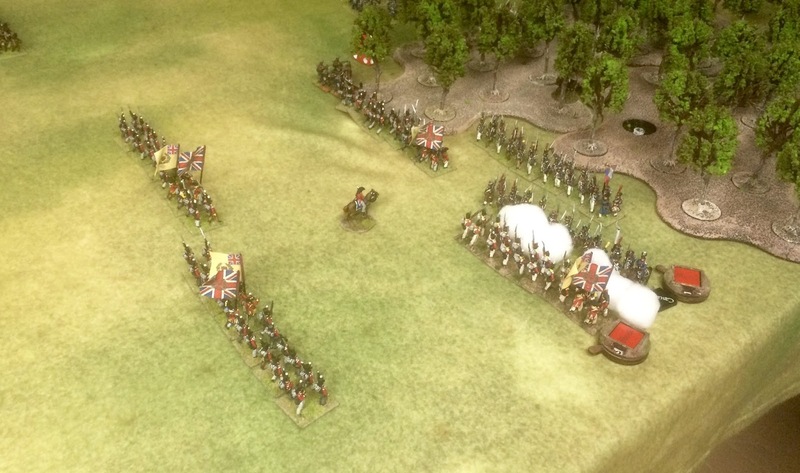 Myself and Adam got together last Thursday for another game of GBCoC (the Napoleonic variation of the TFL rules Chain of Command). The most recent playtest version had a major re-write of the command rules and the movement rules. Command Rules: In the original version of GBCoC, units were activated by command dice (5d6 with each value activating a different level of command or giving bonus options). Unlike WWII CoC each commander that was activated could pass 1 of his command initiatives down the command structure to activate a sub commander within 9" and then this commander would be completed activated. A GdD has 4 Command Activations each time he is activated and thus if he activated a GdB, this sub commander would have 3 Command Activations. This cascading structure was very useful in allowing a player to activate almost all his units but at the same time there was a lot of Command Activations out there which really slowed play. Version 2.6 removed this command cascade in an attempt to shorten the length of time each player was taking to make his command decisions. 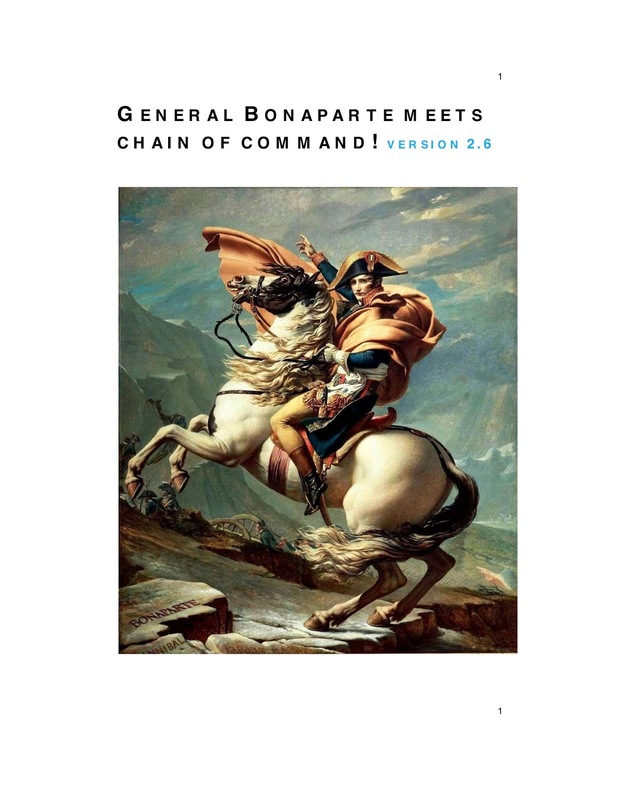 Movement Rules: In the original version only activated units got to make a standard movement (3d6 in inches for a French Attack Column) and unactivated units got to make a single d6 move. In version 2.6 all units can make a standard move. At the same time a standard move was shortened if a unit started within 12" of an enemy unit, by essentially removing a d6. At the same time all maneuvers were now at the cost of a d6. This did simply things. Standard movement does not allow melee to take place you can only move or fire at close range. Command Activations: Four new Command Activations were added to the original group of Directing Battalions, Passage of Lines and the Shock Removal. These include Hurry (add 6" of movement to an individual unit), Inspire (allow a unit to enter an enemy ZOC), Coordinate (Directing Battalions and Passage of Lines on the regiment or brigade or halt a single unit before it makes it's full movement) and Direct (allow a Artillery Battery to fire at long range, they automatically fire at short range). There were some other minor changes. When I originally read through the latest version I became quite alarmed but on playing the latest version I found they were simpler than thought and will accomplish the objective of speeding up the game. This was the position of the troops after the first turn. I believe the French (on the left) started at their picket line while the Spanish held back initially. The British had to start in March column with their tail on the edge of the terrain. 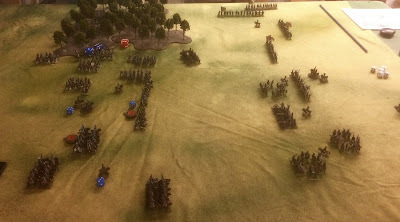 The Spanish after the initial unsuccessful French cavalry attack moving back into line. I was able to maintain good order over the Spanish with the Coordinate Command Action. Their line never faulted. The French centre and right flank, you can see the lead regiment advancing in Ordre Mixte with the battalion in line having sent out a skirmish screen. This was quite effective although the Spanish Cavalry were able to hary this regiment to slow their advance. The British reserve which were never activated as they were not required. 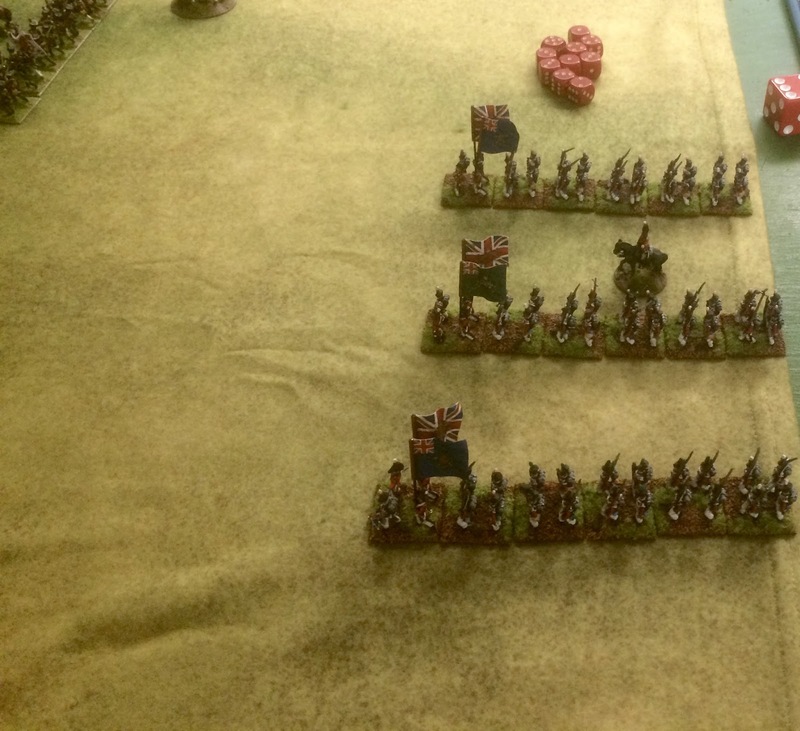 The Spanish in front of them held the British army's right flank. History repeated itself. The British right flank was a little less successful, I was able to break 2 French battalions, but my somewhat uncoordinated attack resulted in the breaking of my largest battalion. By now 3 hours had past, the French had lost 2 regiments and 2 battalions and had suffered numerous command casualties while the Allies had lost only 4 stands with 1 battalion routing. Although we did not finish the game because of some miraculous Force Morale throws by the French it was a clear Anglo-Spanish victory so we ended the game. I believe most of the rule changes were quite successful and both simplified and sped up the game. There are certainly some rough edges with some anomalous effects of the new movement rules. We were also a little unclear about the ADC function in respect to command actions. But one would have to expect some uncertainty after a major revision. You can find Adam's AR here, I will let him speak for himself, his photos of the action are much better than mine. I would like to add with the loss of the cascading command, the player has less ability to make all his units do what he wants them to do. On the surface this may make it seem tougher but in my way of thinking this allows the player to focus on his strategic plan rather then the tactical details (i.e. less units moving tactically each turn). I believe this lack of choice did speed up the game. 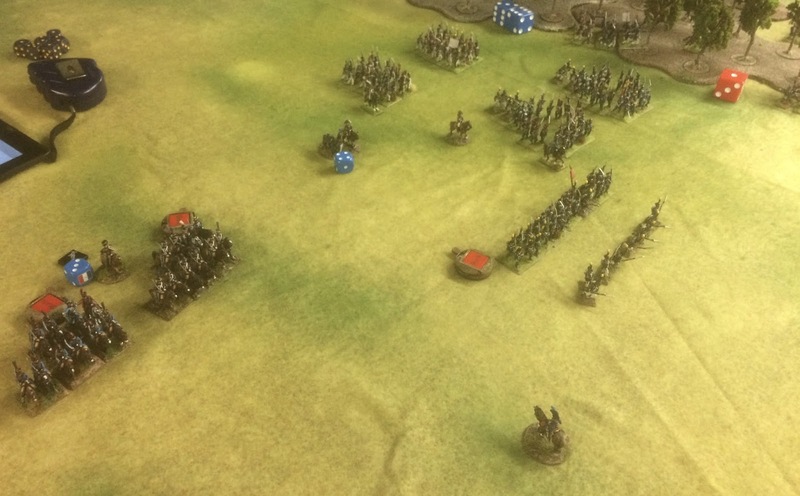 The ruleset is now more similar to WWIICoC, with a greater reliance on strategic planning with the Command Dice function now serving to instill Fog of War than purely a unit activation tool. The position of Commanders on the battlefield is extremely important. Commanders need to be positioned so they can influence units within their Command Range. It is essential to use the order of battle to move your forces: keep Regiments and Brigades together as the building blocks of your force. It may be tempting to send individual battalions off to gain temporary tactical advantage, but it will become impossible to coordinate your force once combat gets started. New players also try and get their whole force into contact. Unless they have a really good command team with several Dynamic Commanders, this is a recipe for uncoordinated, piecemeal attacks which nearly always fail. The best advice for an attacking player is to choose a Brigade for the attack, deploy it so that Commanders can make best use of orders such as Directing Battalions, and position the Divisional General close to the Brigadier so there is a high probability that one of them will be activated each turn to keep the attack moving. I would be very curious about your opinion.